Depending on one’s point of view, leaders can be resilient or obstinate. In the US, some consider President Donald Trump is being resilient in facing up to Congress and refusing to budge over the shutdown. Others just see this as petty obstinacy. In Britain, many admire Prime Minister Theresa May for her resilience, echoing praise of Margaret Thatcher, whose most famous quote was “the lady’s not for turning.” Others, including many in the European Commission and leadership circles of the EU, just see her as being obstinate. So just when does resilience become obstinacy? When does stubbornness turn into recklessness? As in the US, Britain is deeply divided. In such situations, the center collapses and common ground disappears in a flood of abuse and rancor. Compromise becomes a sign of weakness. Isolated in rival camps, group polarization leads inexorably to reinforcing the more extreme negative viewpoints of the other. May has faced a colossal challenge and withstood unending torrents of criticism, accusations of being robotic and almost routine resignations of ministers. Her government was the first in history to be deemed to be in contempt of Parliament, and she scraped through a leadership challenge from within her own party, when 117 Conservative MPs expressed no confidence in her. Then, last week, she lost the vote on her withdrawal bill by 230 votes; 432 to 202 — the largest loss by any government on record. As she got up to speak seconds afterward, it was as if nothing had happened. She treats her EU withdrawal bill as if it was the dead parrot in the infamous Monty Python sketch. Being dogged can be a positive quality; if you are right. Stubbornness can be a help or a hindrance. Yet what is amazing about May is that she appears wedded to being stubborn the whole time and has no other gear. Just ask anyone who worked with her at the Home Office, where she was equally stubbornly wedded to bringing net immigration below 100,000 a year — a goal nobody believed was going to be achieved. Some might see this as a core British trait and one reason why Brexit was voted for; that so many Brits despise being told what to do, not least by an outside power. May is far from the only stubborn figure in this Brexit saga. In fact, few leading characters have been bursting with flexibility. Jeremy Corbyn has shown to be her equal in most regards and, like her, has weathered plenty of arrows of discontent. What was his reaction to the rare olive branch from Downing Street inviting him and other party leaders in for talks? It was to turn it down flat, demanding that a no-deal Brexit be ruled out first. She should not be surprised if fellow MPs decide to take things forward without her. EU officials have also stuck pretty rigidly to their lines and position and perhaps may regret, in private moments of honesty, not being more generous to then-Prime Minister David Cameron in renegotiating Britain’s terms of membership in 2016. Chancellor Angela Merkel of Germany has just sounded off about the importance of give and take, “so that people don’t look back in 50 years, shaking their heads, and say why weren’t we in a position to make a compromise?” Who knows if that will lead to a serious change in the EU stance? Many believe that May has to decide whether to break her party or break the country. To get a deal through Parliament, she will have to concede on her red lines or delay Article 50 to find an exit. She will also have to reach understandings with non-Conservative MPs. Doing that will enrage the Brexiteers. Flirting with a no-deal Brexit will see “remainer” resignations. 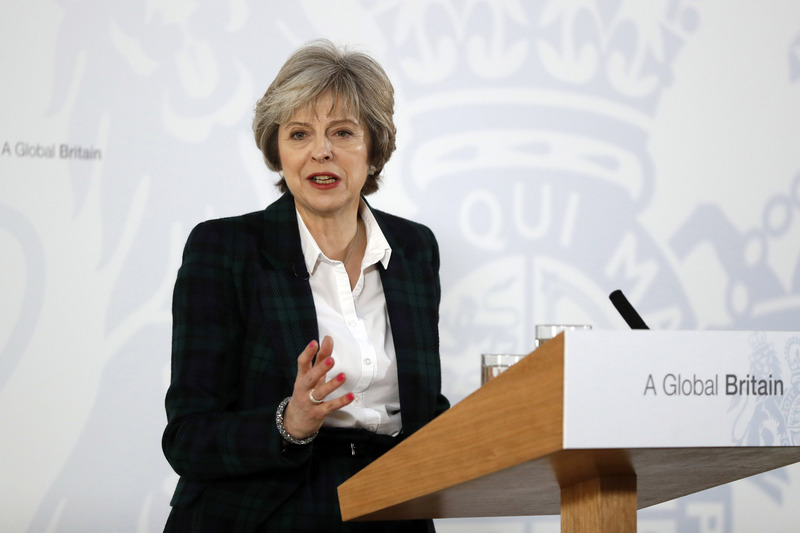 Maybe May is stubborn but she is also fearful, which explains her hesitancy. The harsh conclusion is that not changing her mind is a substitute for not knowing what it is. She lacks the vision to see the way forward. Until she knows what to do, she will just stick and stick again. She should not be surprised if fellow MPs decide to take things forward without her.